12 Real Brides Who Got The Right Jewellery With Their Wedding Lehengas- #Weddingz2017Rewind! After the bridal lehenga the next most important thing is the bridal jewellery and it is super important to match these! Can you imagine the horror if your lehenga and jewellery don’t match? We have shortlisted 12 real brides from 2017 who scored a 10/10 when it came to pairing the right jewellery with their lehenga. After our best bridal makeup, best bridal lehenga, best nose rings, best matha patti, best mehendi lehenga, best of Gaurav Gupta couture, best mehendi decor we bring to you the best wedding lehenga-jewellery combinations of 2017! 1. This egg shell blue lehenga paired with light kundan jewellery. WOW! 2. This bride clad in maroon velvet lehenga and heavy jewellery is giving Bappi Da a tough competition, just kidding! 3. Okay, this is some really unique kundan and emerald jewellery worn on a golden lehenga! 4. How can we not include Anushka Sharma who looks breathtaking in her pastel pink lehenga and wow jewellery?! 5. A peachish pink lehenga with just the right amount of diamond jewellery is making this bride look even more beautiful! 6. Amrita Puri is slaying it with a golden Sabyasachi lehenga and kundan jewellery with a hint of maroon! 9. Ivory lehenga paired with kundan + emerald jewellery. YAASS! 10. Pretty orange lehenga with simplistic kundan jewellery. Love love! 12. A pink and golden lehenga paired with emerald jewellery never fails! 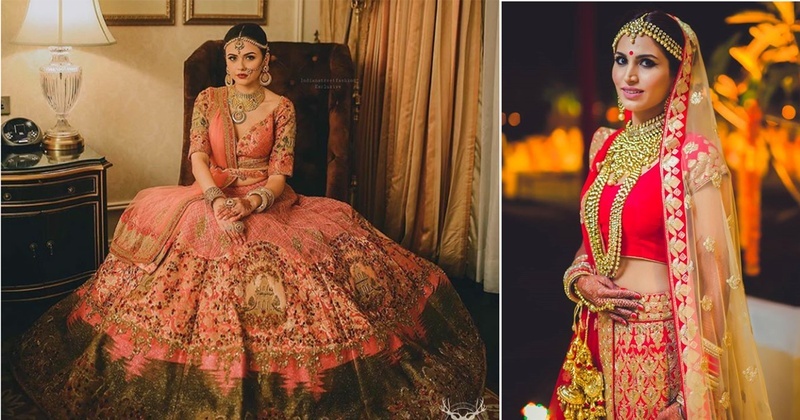 Excuse us while we recover from our love for these brides who look absolutely stunning in breathtaking lehengas and equally awesome jewellery!